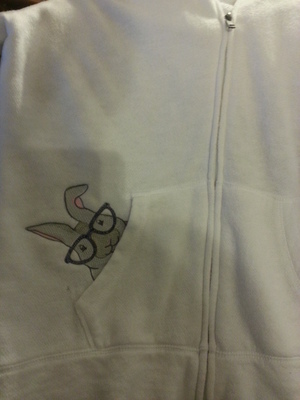 This is an old white hoodie that I had. I saw this project on Urban Threads and bought the design and stitched it (nothing original about this). It is just as cute as can be! It hasn't cooled down enough to wear it yet, but I'm all ready for fall now. Hope it made you smile as much as it did me. I love Urban Threads designs and ideas! This is so cute. You've got it perfectly in place. Great job and he is so cute. Not hard at all with the stretchy hoodie fabric. I suspect if it would be really hard with woven fabric. People are going to be staring at you to see what is peeking out of your pocket! Really funny. I love designs for kids with eyeglasses - helps them accept their glasses. AND I love when adults use kid designs (Half my closet). Enjoy. Love the pocket peekers...nice job! They have the greatest designs! This is well done! Well done! It is very cute!